The official Miami International Boat Show website offers a host of pricing options including various VIP packages, group pricing, combo passes, and much more. Be sure to review the pricing to find what best suits your intended level of participation. Enhance your show experience with the VIP experience! Enjoy luxurious amenities such as an air-conditioned lounge, complimentary food and drink, entertainment, and additional perks. Atlantic Cruising Yachts is pleased to be partnered with LH-Finance who is offering an elevated VIP experience for those that prequalify. When you request your prequalification, mention you heard about the opportunity through us. You made the trip to Miami, you might as well go all out! As a popular city, Miami offers a myriad of local transportation options. There will be a water taxi that runs from Bayfront Park and the American Airlines Arena to the Miami Marine Stadium that is free with your admissions ticket; keep track of the schedule with the Raft Up app! If you’re driving, there are several parking garages in the area where you can catch a shuttle to the show. There are also public transportation options available. After you wrap up an exciting day perusing the show, unwind with an evening exploring all that Miami has to offer. Miami is known for its exquisite beaches, live music scene, Latin-infused cuisine, and much more. From lively nightlife to relaxing restaurants there is something to do for everyone. Brainstorm ideas for activities using the official tourism site. 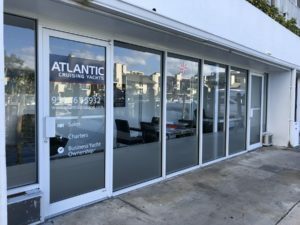 Follow Atlantic Cruising Yachts on Facebook and Instagram for the latest information about the yachts our team will be showing. We’ll be posting updates throughout the entire show, be sure to stop by and hop in a photo or tag @atlanticcruisingyachts in your photos! The Miami Boat Show lists the following hotels as official properties: the Miami Marriott Biscayne Bay, the Hyatt Regency Miami, the InterContinental Miami, the JW Marriott Miami, and the JW Marriott Marquis Miami. If availability is limited for the show dates, as we are only a few weeks out, alternative arrangement search sites to consider include Airbnb, Travelocity, or KAYAK. 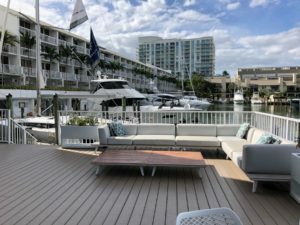 If you prefer to stay in Fort Lauderdale, consider the Hilton Fort Lauderdale Marina on 17th Street where our new office is located. 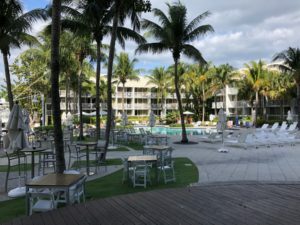 Enjoy the tiki bars, pools, and beaches before making the quick drive down to the show. For those interested in learning about the most fiscally responsible approach to new yacht ownership, sign up for one of our many live Business Yacht Ownership® seminars. The seminars will be hosted by an independent certified financial planner and tax advisor throughout the Miami International Boat Show at Booth 901. See you there!